Global Environmental History introduces this rapidly developing field through a broad and thought-provoking range of expert contributions. Environmental history is a subject especially suited to global and transnational approaches and, over the course of the present generation, an increasing number of scholars have taken up the challenge that it presents. The collection begins with a series of chapters offering truly global visions; they range from reflections on the role of animals in environmental history to an overview of environmental change over the past ten millennia. Part Two switches to a sharper focus, featuring essays that characterize the distinctiveness of certain key regions such as China, Russia, West Africa, South Asia, Europe, and Latin America. The final part of the book examines different forms of modern environmentalism, ranging from the U.S. and its fascination with wilderness, to Japanese concern with human health, and on to Peru and India, where the environmental debate centres on access to resources. 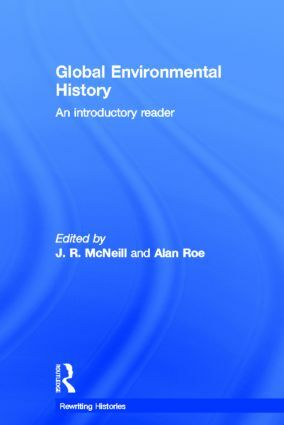 Global Environmental History will be an essential resource for students of Environmental History and Global History. John R. McNeill is University Professor in the Department of History and the School of Foreign Service at Georgetown University. His previous works include Mosquito Empires:Ecology and War in the Greater Caribbean, winner of the Beveridge Prize of the American Historical Association,and Something New Under The Sun: An Environmental History of the Twentieth-century World, winner of the World History Association Book Prize. Alan Roe is a Ph.D. student in Russian environmental history at the Department of History, Georgetown University.